There’s nothing worse than coming home after a long day of work, getting into bed, exhausted, and finding yourself unable to fall asleep because of your nighttime reflux. Instead of struggling to find a comfortable position, do yourself a favor and check out MedCline, a 100% natural treatment for nighttime reflux. Before you start researching MedCline reviews and thinking about replacing your pillow, you need to ask yourself a few important questions. First of all, do you suffer from acid reflux ̣̣̣̣̣̣(1)? If your answer is yes, then MedCline could be the right option for you. If you’ve tried various other methods to treat your nighttime reflux, like medications or other wedges or bed risers, with no success, MedCline may be the answer to your wishes. Not only has MedCline been proven to be more effective than other methods (2), but it is also one of the few all natural ways to combat your reflux. Think about which MedCline product (pillow system or wedge) best fits your lifestyle. Do you share your bed with another person? The MedCline does take up space and switching sleeping sides at night requires some maneuvering. What is your weight? The MedCline Reflux system has a weight limit of 250 pounds. After thinking about these factors, you should have a clearer idea about whether the MedCline is something that could be right for you. MedCline may look like a simple wedge pillow upon first looks, but it is much more than that. Both the MedCline Reflux Relief System and the Advanced Positioning Wedge are specially designed to help in the treatment of acid reflux. Providing elevation and inclination to your whole torso, MedCline will keep you comfortable and help you stay in the best position for acid reflux while you sleep, without worrying about slipping or sliding down. Though other pillow models have tried to provide the same results, MedCline has beaten the competition, and is show to reduce heartburn and regurgitation, reduce esophagus acid exposure, and provide an overall improvement in your sleep quality. Don’t just count on hearing what other people have to tell you about MedCline, learn about the features of this system yourself! Hearing that MedCline has more success in treating acid reflux than other products that try to do the same, probably makes you wonder how MedCline gets its success, right? It lies in the design of MedCline. Whereas most wedge pillows are simply a single piece of foam cut into a triangle, MedCline is made using four different types of medical-grade foam, which are shaped and placed strategically for optimal results. Advanced Positioning Wedge: the advanced positioning wedge elevates your whole torso, not just your head neck, keeping acid in your stomach. The wedge’s strategic design ensures that you will not slide down during the night, causing you to wake up sore. MedCline Pillow: the body pillow is an important aspect of the system, especially for those who are not accustomed to sleeping on their side, as it provides added comfort. Another great thing about MedCline, making it a convenient option, is that both elements, the positioning wedge and pillow, come with removable cases, which can be washed in your standard washing machine cycle. So there’s no need to worry about difficult upkeep. Now that you’ve learned more about the MedCline system, you should think a little more about the benefits that you get from using the advanced positioning wedge. Though seemingly simple, this technology can change your experience with acid reflux. Side Sleeping: one of the main reasons that other wedges and risers are not effective for acid reflux is that they promote back sleeping. Unfortunately, sleeping on your back actually worsens acid reflux. Even if you’re not a natural side sleeper, the positioning wedge will help you learn this habit in a comfortable way. High Elevation: if you’ve used other wedges in the past, the advanced positioning wedge may look quite high to you. However, the reality is that in order to treat acid reflux and prevent regurgitation and heartburn, you need to sleep at high elevation. Undisturbed Sleep: the patented Cradle-Loc design of MedCline makes sure that you do not slide down, which means you won’t be woken up to reposition yourself. Reduced Regurgitation and Heartburn: MedCline has been shown to be highly effective in reducing the main symptoms of acid reflux, which means that you will find yourself able to sleep through the night more comfortably. Gradual Improvement: MedCline has been proven to result in less acid in the esophagus, which means that if you continue sleeping with MedCline over time, you may be able to improve your acid reflux overall. Better Sleep: the sleeping position provided by MedCline doesn’t help with just your acid reflux, but will improve your quality of sleep. Sleeping in an inclined side position will allow your body to do its necessary work overnight in the best possible way. The benefits you stand to gain from sleeping with MedCline are a collection of changes that could make your life more comfortable in the long run. Set it Up: you’ll just place the advanced positioning wedge on top of your bed and top it with the pillow. Position Yourself: choose your sleeping side, insert your downside arm into the special arm pocket. Get Comfortable: once your securely positioned, let yourself adjust to the new sleeping position. Give it some time, as it may take a while to adjust, but once you do, you will experience the benefits and increased comfort in your sleeping. That’s all! Easier than you imagined, right? Don’t let uncertainty about how to use MedCline stop you from trying it, because it truly is super easy for everyone. You can use your own head pillow with the advanced positioning wedge to transition into using the system, in the beginning. Get comfortable sleeping at a new angle, and then add the MedCline body pillow. Stock up on a few extra covers for the wedge and body pillow so that you never have to worry about your washing schedule. Remember that MedCline will take up about half of a queen size bed. Be patient! It can take a few days for your body to adjust and for you to notice the differences from sleeping with MedCline. Don’t give up, you’ll see the benefits. Reach out with any questions you have. MedCline has excellent customer service who will be able to answer all of your questions and help you with any issues you experience. With these tips and the information you’ve learned about MedCline, you’re ready to try it and see if it will help you with your acid reflux. Far more affordable than MedCline, the InteVision Foam Wedge Bed Pillow is another great option to help you fight your acid reflux using inclination and elevation. 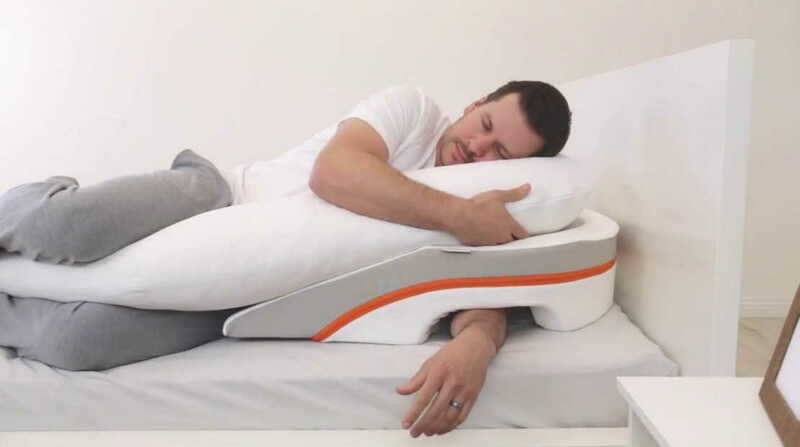 With this pillow, you will elevate your whole torso for comfortable sleeping. The design is suitable for sleeping in any position, whether you prefer to sleep on your sides or back. The pillow is made with an easy-to-remove and machine washable cover for your ultimate convenience. You’ll find that you sleep with the combination of the top memory foam layer set on the firmer base layer. Acid Reflux Wedge Pillow (32″x30″x7″) with Memory Foam Overlay and Removable Microfiber Cover “BIG” by Medslant. If you want incline, but not too much, then you will appreciate the Medslant wedge pillow. While you get enough elevation to positively affect your acid reflux, this pillow keeps you at a reasonable inclination, so that the transition to sleeping with this wedge is not too difficult. Slightly more expensive than the first listed alternative, the Medslant wedge pillow uses hypo-allergenic isofresh memory foam to help you sleep all night and wake up feeling refreshed. This pillow, like MedCline, takes up half a queen size bed, and allows you to sleep on your sides or back. The most affordable alternative, the Mabis wedge pillow provides sleeping support for issues with acid reflux, while doubling as useful back support for reading in bed! The poly-cotton cover is removable and suitable for machine washing, and the pillow’s durable foam will keep you sleeping comfortably for years. You never know when you made need to use this wedge for something else. It can even be used to elevate your feet or legs, if you experience circulation issues. You can’t beat the value and multipurpose functioning! Are you suffering from neck pain? : check out this article: The Neck Hammock Reviews 2018: Relieve Pain in Just 10 Minutes? If you suffer from acid reflux which affects your quality of sleep, it’s time to do something serious about. Without having to commit to chemical medications that don’t work well and cause side effects, you can use MedCline, or a suitable alternative, and find your acid reflux improving over time!